BLACK AND WHITE photography is a masterful medium. Despite — or perhaps because of — its simplicity, it really shows off a photographer's skill and eye. Digital black and white photography reflects this utter simplicity. Each pixel in a final black and white JPEG image is assigned a value from 0, meaning pure black, to 255, meaning pure white. You can hardly get simpler than that and still call yourself a photographer. This is the kind of color space used in cameras, and this is also used when editing photos. We have three numbers, one each for the values of Red, Green, and Blue, and these numbers (for 8 bit files) go from 0 to 255. The beauty of this system is that when you continuously vary any one of the RGB colors, the tones you see vary in a natural manner — you typically don't get strange discontinuities in the color you see. In this example, each slice of the image above has the named color go from 0 at the bottom, to 255 at the top, with the other color values being zero. A mix of numbers gives you different colors. If all three values are zero, the result is black; if all three numbers are 255, then it is white: whenever all three values are the same, we get no color at all, but varying shades from black through gray to white. This is very useful in Photoshop: if we want to white balance an image, we just have to identify places that ought to be white, gray, and black, and then apply curves to force the three numbers to have equal values in each area. A bigger number means a brighter pure color. 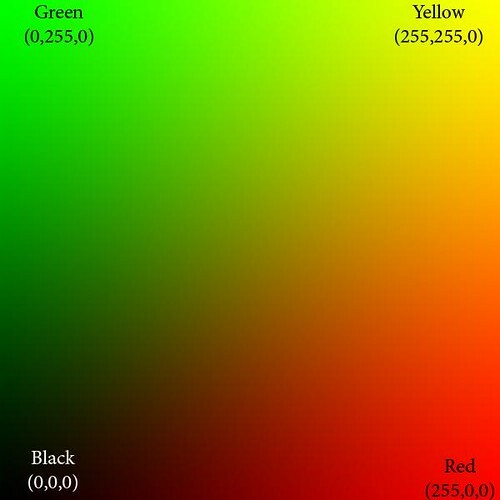 Now, here is the big limit to the RGB color space: what specific color is equal to 255? As it turns out, that choice limits the gamut, or range of colors that can be represented by RGB. And so, we have many RGB color spaces, including the common sRGB color space used here, as well as AdobeRGB, ProPhoto RGB, ColorMatch RGB, and so forth. sRGB has the narrowest gamut of the bunch, while all the others can represent a wider range of colors. Practical computer science considerations are why we are limited to 256 levels for each color: this is due to the binary arithmetic used by computers and also due to the formerly extreme cost of computer equipment. 256 levels per color gives us a good total number of colors, and is generally adequate for quality photography. Much fewer numbers of colors will likely introduce banding in the final image. But it is for this reason that sRGB is a decent color space to use, even though it can't represent the full range of colors: wide gamut color spaces may introduce banding because they might still use only 8 bits per color, and so the colors are spaced further apart. When using Photoshop, I recommend using 16 bit mode, especially if you are going to do some extreme edits to your images. This reduces the possibility of banding. However, you still have to reduce your final image to 8 bits per color if you want to display photos for the web. Also, be aware that many web browsers can only view sRGB images accurately: other color spaces will look bad. 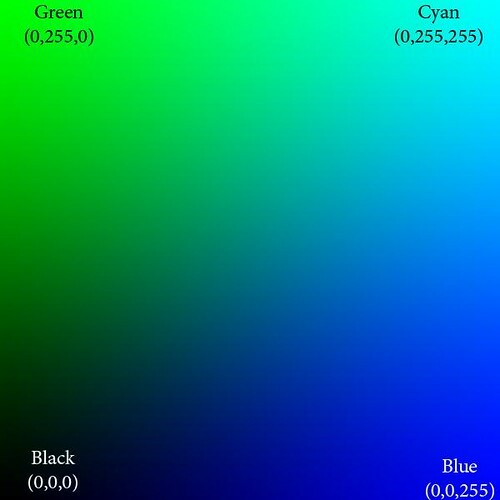 Another consideration with RGB is how perceived brightness varies as the values go from 0 to 255. The simplistic idea that 200 will be twice as bright as 100 doesn't work well — for the human eye, twice as much light doesn't look twice as bright, rather it looks only a bit brighter. This phenomenon lets us see over vast ranges of brightness, and so the RGB scheme accounts for this by using gamma correction, which I'll go over in the future. Gamma correction assigns the RGB numbers in a way that appear a bit more more perceptually uniform. 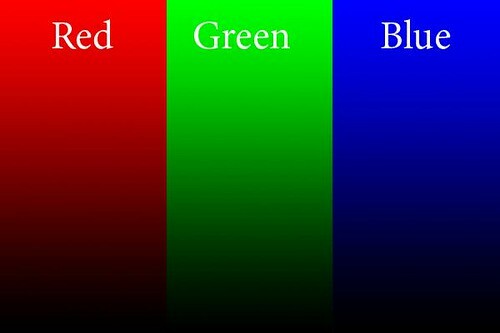 RGB is the most common color space used, but that does not mean that it is the best for all purposes. When using curves, all three colors have to be modified at the same time, otherwise you will get color shifts. Also, how Photoshop determines the brightness of a particular color may not accurately reflect how the human eye sees it. Is this what you imagined? For the red channel, we have no Green or Blue data, and so they are black in the places of the image that are green and blue. A value of 0 is black, and so 255 in the red channel will give you the brightest pure red. 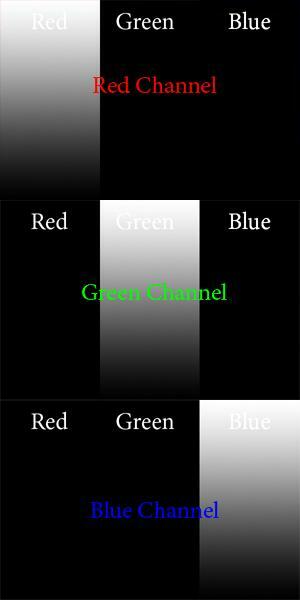 Just by looking at the Red channel, you ought to be able to determine that the only color you see on the left is red. Now, this is pretty straightforward for pure colors, but when we have other colors, it gets a bit more complicated. Here we show only the red and green color channels, mixed together in various proportions. Can you imagine what the color channels look like? The blue channel is completely black (except for the white text). The red channel goes uniformly from 0 on the left to 255 on the extreme right, and likewise the green channel goes from 0 on the bottom to 255 on the top. At the extreme bottom of the image, both green and blue are 0, and so we see pure red tones going from black to bright red. Likewise, along the left side of the image, we have pure green tones. The upper right hand corner of the image has both red and green at 255, and blue at 0: this is pure, bright yellow. Along the right edge we see orange, which is a mixture of yellow and red, or rather, bright red with some green and no blue. The top edge shows lime green, a mixture of yellow and green, or pure green and some red and no blue. The diagonal line from black to yellow shows equal portions of red and green. You may notice how very little of this region looks particularly yellow but instead is kind of a muddy color. Actually, the color brown is in reality a dim yellow or orange color, which looks muddy merely because of bright surrounding colors. If you take a brown object, put it on a very black background, and brightly illuminate it, it will likely look nicely yellow or orange, and not brown at all. Here we show only green and blue, and the red channel is black. Whenever you see a bright saturated yellow, you will know that the blue channel there is black, and likewise for the other opponents. 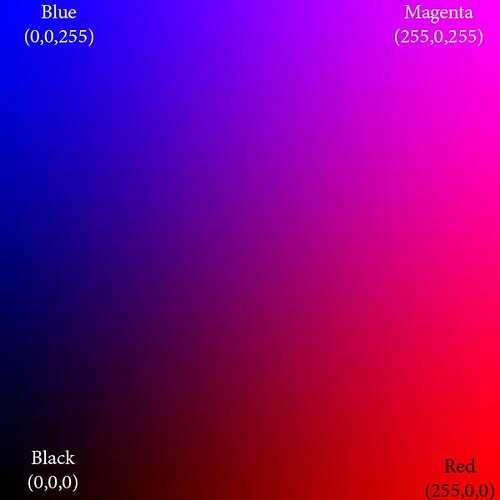 Red and blue gives magenta. Magenta is the anti-green. Isaac Newton's color theory is very deficient because it cannot account for magenta colors; however, even this RGB system is deficient because it cannot give us a pure violet — a color that is ultra-blue, with no red it it whatsoever. But because of how we see, some tones of magenta appear violet to our eyes. Yes, color vision is complicated. These illustrations show pure colors. If we were to include non-zero values for all three colors, we won't get any new colors, but only grayer and lighter tones of these existing pure colors. Having three RGB colors reduces saturation. Just by looking at the RGB numbers, you ought to be able to tell how saturated a color is; and if all three RGB numbers are equal, then you know you will have a completely unsaturated color: white, black, or shade of gray. Any one or two RGB low; the others medium: unsaturated dark color. Suppose you take a photo with a ordinary clear blue midday sky. Are the RGB numbers such that B is greater than G, and G is greater than R? If not, is it your artistic intent to make the sky look purple, or some other color than sky blue? If not, and if you intend to share your photos with others, especially on the Internet, then be sure your colors are right. If an objectively purple sky looks like a normal sky blue on your computer monitor, then you need to calibrate your monitor. Remember, color calibrate your images before you calibrate your monitor! If you are confident that you understand RGB, then take An RGB Quiz. For an overview of the CMYK color system: Color Spaces, Part 2: CMYK and Part Two of "Color Spaces, Part 2: CMYK" as well as A CMYK Quiz. See also Color Spaces, Part 3: HSB and HSL and Color Spaces, Part 4: Lab. I find it interesting that (at least on my mac) the example images in your post have noticeable artifacts (especially the blue/red one). Clicking through to your flickr page, the "medium" image does not sufffer from them, but the "original" image does. Odd. Ugh, you a right. That is what happens when I am in a hurry and don't triple check everything! I put in better looking sizes of the images.